Traditional Home just sent a “We want you back” packet. * The packet has a little booklet in it. I would Pin every picture in the booklet. I love Traditional Home magazine. However you envision the good life… you’ll find your inspiration here! The best homes have character and personality all their own – they stand out in a cookie-cutter world of design. Let Traditional Home show you how to combine beauty and function, character and sociability… and make everyone feel at home. 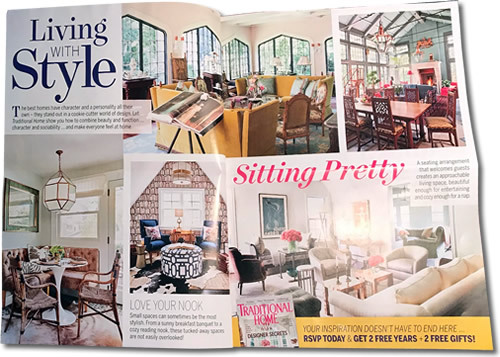 The little booklet has a page each for Sitting Pretty, Bathing Beauties, Bedroom Escapes, Make an Entrance, Perfect Porches and It’s All in the Details. 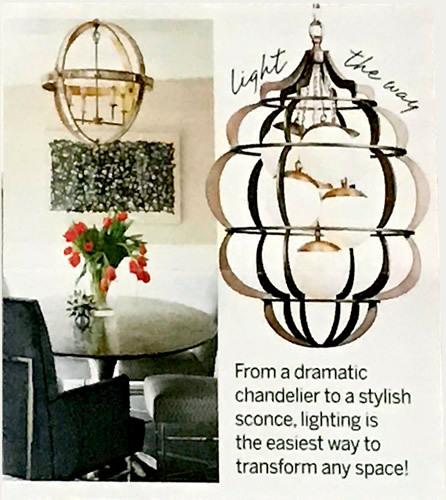 From a dramatic chandelier to a stylish sconce, lighting is the easiest way to transform any space! Always on the lookout for anything about Lighting, this caught my attention. I’ve never waited to resubscribe before. We are building a house and I was waiting to resubscribe till the move. The closing and the renewal are the same month. I found out if you wait, you get two free years for the same price and they send you books! The orb pendant on the left is similar to a lot of orb pendants. I don’t know which one it is. I figured out what the chandelier pendant on the right is. It is the Nebula Chandelier C 8625. It is designed by Barry Dixon. The dimensions are 24″ x 33″. The finish is Mottled Silver and Satin Brass with Opal Glass Orbs. This entry was posted on September 23, 2018, in Lighting, Traditional. Bookmark the permalink.